Radiation treatment is one of the three primary mesothelioma treatments (the other two are chemotherapy and surgery). Radiation can be effective at reducing the size of mesothelioma tumors, especially in conjunction with chemotherapy. But, like the other standard mesothelioma treatments, radiotherapy has its limits. A new mesothelioma clinical trial will explore a method to make mesothelioma radiation treatment much more effective. The new mesothelioma clinical trial started recruiting patients at the end of April, 2018. The trial will test a treatment that is being developed by Bayer researchers in Oslo, Norway. The Oslo research team joined Bayer in 2013, when their company, Algeta ASA, was bought by the larger pharmaceutical company. Radiation treatment is most commonly administered in the form of very concentrated X-ray beams. This is called external beam radiation therapy. Radiation can also be given through brachytherapy or sealed source radiation therapy, where small radioactive pellets are inserted directly at the tumor site. Brachytherapy allows the radiation to flow directly into the cancerous tissue without traveling through and possibly killing healthy cells. A third form of radiotherapy is called unsealed source radiation therapy or systemic radioisotope therapy. This type of radiation treatment is injected, much like a chemotherapy treatment. The radioactive isotopes seek out and destroy cancer cells. The Oslo researchers specialize in research on the radioactive element thorium. In nature, the most common types of thorium are thorium-232 and thorium-230. The numbers of different thorium isotopes represent their mass (the combined number of proton and neutrons). The most common thorium isotopes have a very long half-life. This means that, while they are radioactive, they decay and emit radiation very slowly. Thorium-232 has a half-life almost as long as the history of the universe back to the big bang. The thorium-227 isotope has a much shorter half-life: less than 19 days. This is perfect for use in systemic radioisotope therapy because it lasts long enough to reach its target. It then gives off radiation for a short period of time before it loses its radioactivity. Systemic radioisotope therapy needs to reach the target cancer cells without damaging healthy cells. To achieve this, scientists attach the radioactive isotopes to antibodies that seek out cancerous tumors. The bond between isotope and antibody has to be strong. Thorium-227 will bond with other molecules in the body if it isn’t tightly enough combined with the antibody that ferries it to the tumor. The Oslo research team has developed a combination that creates a very stable molecule, which is unlikely to break apart before it reaches its destination. The antibodies look for cells with unusually high levels of mesothelin. Mesothelin is a protein made by mesothelial cells. Some types of cancers, including mesothelioma, have too much mesothelin. Chemotherapy seeks out cancer cells that are rapidly dividing. The thorium-227 radiation treatment can find cancerous cells even if they aren’t currently reproducing. It can also target small clusters of cancer cells that have broken free from the original tumor and might be about to metastasize, which can be hard for other treatments to attack. 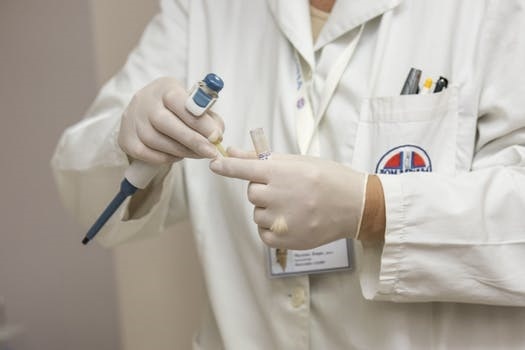 If this mesothelioma clinical trial shows promising results, it could be the gateway to a new and more effective mesothelioma treatment. Metastatic cancers are more lethal than the original tumor. Because of this, mesothelioma treatments try to reduce the size of the original tumor and prevent it from metastasizing. This new radiation therapy could be a powerful tool in this fight. The Bayer thorium-227 treatment has had good results in lab tests. The new mesothelioma clinical trial will be the first time this radiotherapy is tested on humans. Clinical trial NCT03507452 is a Phase 1 clinical trial that will enroll about 42 patients. Eligible mesothelioma patients must have tumors with the epithelioid cell type. The study will accept patients with pleural or peritoneal mesothelioma and also those with serous ovarian cancer. What Is a Phase 1 Mesothelioma Clinical Trial? One of the identifiers that tells you about a mesothelioma clinical trial is the phase. Clinical trials start by testing the dosages for a new treatment and the toxicity to humans. This is called a Phase 1 trial. In Phase 1, researchers work with a small number of patients. Everyone gets the treatment being studied; there are no placebos. In later phases, scientists will work with ever-increasing numbers of patients. The study period may cover a number of years, so researchers can determine the long-term effectiveness of the drug and any side effects that might appear over time. This Phase 1 mesothelioma clinical trial is only enrolling patients with refractory tumors. A refractory tumor is a cancer that doesn’t respond to treatment or stops responding to treatment. You might want to consider this study if you’ve reached a point where the treatments your doctors have to offer aren’t slowing the progress of your mesothelioma. Mesothelioma clinical trial NCT03507452 will enroll patients in the US, the Netherlands, Sweden, and the UK. The researchers will administer increasing doses of the injected treatment, starting with 1.5 megabecquerels (a unit of radiation abbreviated as MBq). Participants will receive a treatment at the beginning of each cycle. The cycles are six weeks long. With each injection, the researchers will increase the dose by 1.0 or 1.5 MBq. They will study the side effects of the treatment and its effectiveness in controlling cancerous tumors. The study is expected to last about two years. If you’re interested in joining a mesothelioma clinical trial, there are a number of studies to choose from. As immunotherapy treatments expand the options for patients with late-stage or hard-to-treat cancers, mesothelioma patients have more opportunities to participate in advancing the science of cancer treatment – and more hope of finding a treatment that will help them beat back this deadly cancer. A mesothelioma clinical trial can give you early access to the next big breakthrough in mesothelioma treatment. Since the clock is ticking for mesothelioma patients, early treatment can be vital to extending your life expectancy. At the same time, your participation in a mesothelioma clinical trial will expand the knowledge of researchers who are working to find better mesothelioma treatments.